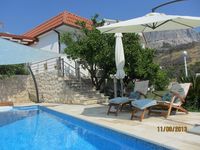 Vacation home Villa Nedika - few minutes walk to beach, bars, restaurants. 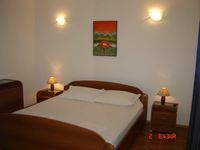 Property 29: Vacation home Villa Nedika - few minutes walk to beach, bars, restaurants. Clean. Good A/C. Nice pool. Beautiful view. Adored the old olive tree. Two of us stayed 5 nights mid-Sept. Very relaxing. Went up the ladder to rooftop for wide-open views of sky, water, boats, and distant islands. Sunsets supreme, with a few gnats (bug repellent helped). The fruit trees are awesome, and add to the privacy. Rosemary growing on the patio was delicious in our baked chicken. Easy and picturesque 2-hour drive down Highway 8 to Mostar, Bosnia Hercegovenia, a doable day trip. Delicious burger at Clementine&rsquo;s Pub on the waterfront at Tucepi which is next to Podgora. Also marveled at the tiny church of St George dating from 1311! Liked the quiet, peaceful way people hung out at the water, lying on the small pebbles. Not at all loud, enjoying the clear water, the sun, each other. Croatians appear to be lovers of simple joys. We flew into Split, got groceries at Interspar-City Center Mall there. Thereafter at Lidl in Makarska. Best to get provisions before you get to the house, so you can get on with pure relaxation. House already had nice &ldquo;little touches&rdquo; - shampoo, conditioner, body lotion, spices, coffee, plastic wrap, paper products. Just really needed aluminum foil, matches, and olive oil for grilling out (and the bug repellent). We are age 60+, only walked one time down, then back up, the hill taking stone steps into Podgora. Truly hot and exhausted by this, but between the welcoming pool and A/C, recovered nicely. Did not make it to Dubrovnik, but found the coastline south of Podgora absolutely stunning, and wished we&rsquo;d given it more time. Thanks again for a vrbo that checked the boxes for peace and quiet! We are two couples from the U.S. this was our first trip to Croatia. We didn&rsquo;t want to stay in a big city. This was our spot!!!! Upon our arrival, Our host was there to meet us. The apartment had everything that we needed. We didn&rsquo;t spend much time in the house as the deck and view were amazing. It is a short walk down the hill to the boardwalk that had restaurants, bars, stores and the beach. It is a piece of heaven. You won&rsquo;t be disappointed .